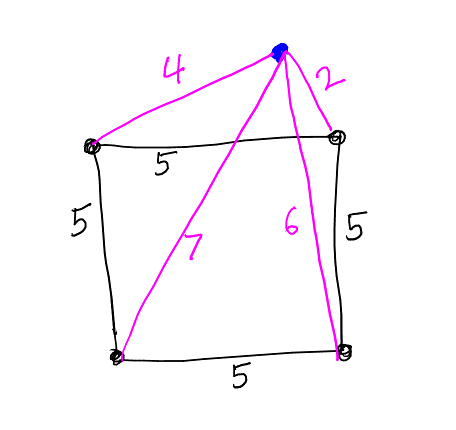 Is there a square with integer side lengths and a point in the plane whose distance to each corner of the square is an integer? Equivalently, take a one-by-one square in the plane with corners $A$, $B$, $C$, $D$. Can you find a point $P$ in the plane such that all four distances $|AP|$, $|BP|$, $|CP|$ and $|DP|$ are rational? This is equivalent to the previous version because, if you do it will all integers, then you can scale by the side-length of the square to get this version, and if you solve this version, you can scale by the common denominator of the rational lengths to get the integer version.